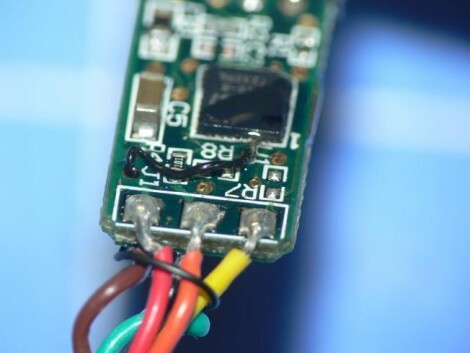 Hackaday alum [Adam Harris] hacked an FTDI cable to use for programming his Arduino. After cracking open the plastic case he found the FTDI chip used is the same as the one in the SparkFun programmer. The only real difference was that his cable wasn’t resetting the Arduino, he had to do that manually. The solution was to reroute the RTS wire so that it connected up to the DTR pin. This proved difficult because of the tiny footprint of the chip, but after many tries he managed to get a piece of wire wrap soldered in place. Umm… I just used one of these to connect to an Arduino the other day, and this “hack” is completely unnecessary. You can just use the RTS pin instead of the DTR signal and it will still work. That’s great! Must have been hard to solder to the QFN, without any traces to connect to. Holy crap, did he solder to a QFN? Can’t you just set DTR as reset in software? This is indeed a useful hack. This hack would allow you to BSL program the MSP430 on the cheap. I applaud the soldering effort here! I’ve had to solder 30+ gauge wire to more than one pin on a QFN-or-comparable sized package at work before, and it is no joke. Once I had to place the chip and solder a lead… It took me a long time and I killed one chip with a miswire. That aside, I think the actual concept of this trick is completely obvious, the skill to execute it however is worth a nod. Whoa. Who gave him the Epic Soldering Iron of Epicness +1? I also like wire-wrap wire for jobs like this. If it works for ’em, where’s the fail? Having to solder while looking under a magnifying glass/microscope is a SERIOUS pain. Your eye/hand coordination is all off, that extra cup ‘o joe is making your hands shake just enough that the tip of the iron is shaking like a whore in church, and your boss is reminding you that the extra time this takes is screwing up your time-per-jobs metrics, and this may be your last job with the company. This is tough work. Glad I’m not doing it anymore. Man; I’d probably end up doing serious damage to an area about 3 yards around me blowing up in anger trying to solder that, and walk around with blisters too. Although I did manage to do some very fine stuff on rare occasions, but I have to be in a special zone. heh.. i’ll take your QFN and raise you a TQFP. i’ve had to solder really teeny wires to flash memory before, as well as those FC-30 orientation sensors. Little tip, if you are doing this try baking soda on the superglue as it adds mechanical strength. managed to “recycle” working accelerometers off dead apple macpro laptop M/Bs using this technique. rumour has it that the Iod Touch has a micro accelerometer that can be used for applications that need one 2mm*2mm such as pen data recorders. Recent builds of avrdude (those recognizing ‘-c arduino’ as a programmer type) appear to toggle RTS and DTR together. In the future, once that reaches saturation (perhaps rolled into some later version of the Arduino app), the whole FTDI vs. SparkFun cable thing might be a moot point. Still, kudos on the mad soldering skills! Try heat-strippable magnet wire when wire-wrap wire is too big.